Following on from Character's Cyberman Voice Changer Helmet and Dalek Sec Hybrid Mask comes the show's most famous alien. Get ready to hide behind your sofas - the Daleks are set to invade Earth once again as the Time Lord's alien adversaries hit the shelves in the form of the scarily realistic Dalek Voice Changer Helmet. As we've come to expect from Option's range of licensed toys, the Dalek Voice Changer Helmet is incredibly good value for money and offers something for everyone. 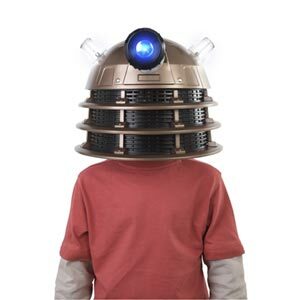 Young fans will relish the chance to run around exterminating anything that moves, serious Who collector's will be one step closer to owning their very own full size Dalek (add a wheelie bin and they'll be almost there) and parent's can have fun chasing their offspring around the house. There are three buttons which allow users to speak and have their speech transformed into the voice of a Dalek, play a number of already installed voice commands, or have the helmet emit one of its preprogrammed sound effects. "Halt! Or you will be exterminated"; "Article multi spectrum scanning now engaged" (although I'm not 100% that's what it says); "We are the supreme beings"; "Seek, locate, annihilate"; "You are an enemy of the Daleks"; "Obey the Daleks"; "No other warning will be given"; and "Exterminate!" - followed by the sound of a Dalek gun firing. Pressing the exterminator sound effect button results in different sound effects being played, and the voice changer button allows you to sound like a Dalek. The helmet requires 3 x AA batteries (not included) to work. Although, there is a cell button already inserted that allows you to test the effects for a brief period of time - this is designed to be used in stores so that potential customers can see how it sounds. 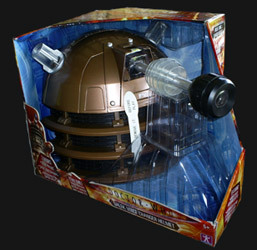 As well as speech, the Dalek's eyestalk lights up and its ear lights flash - synchronised with the speech. The eyestalk is also designed to be detachable so that you can easily store it inside the helmet when not in use. Of all the helmets released so far, this is the best. It's made of strong plastic, and the attention to detail (unsurprisingly for those that have followed Option's output over the years) is amazing. This is a lot of fun and looks great when worn, or as a centrepiece in any bachelor pad.